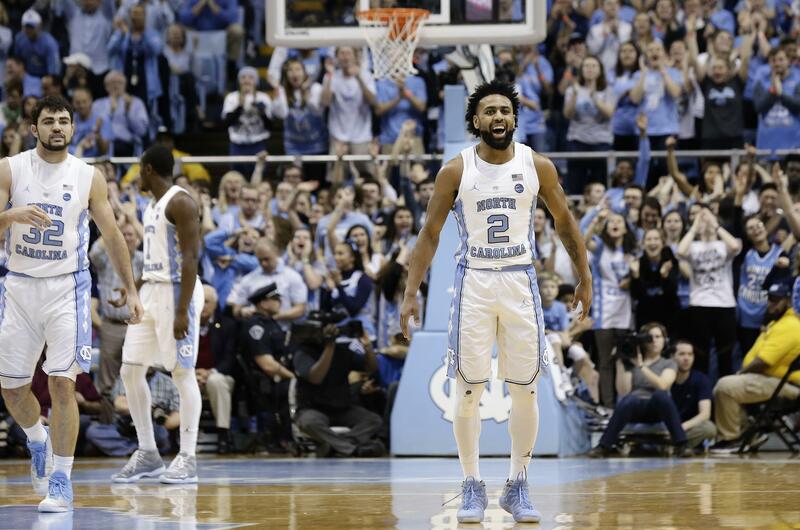 Mon., Feb. 12, 2018, 9:39 p.m.
North Carolina beat its two biggest rivals, then pulled away late to beat Notre Dame to cap a demanding stretch. Theo Pinson scored 14 of his 16 points after halftime to go with 10 rebounds, helping UNC pull away late to beat Notre Dame 83-66 on Monday night in Chapel Hill, North Carolina, for its third win in five days. (20) West Virginia 82, TCU 66: Teddy Allen scored 16 points, giving the Mountaineers (19-7, 8-5 Big 12) a needed spark off the bench for a win over the Horned Frogs (17-9, 5-8) in Morgantown, West Virginia. James “Beetle” Bolden added 14 points, Daxter Miles Jr. scored 13 and Wes Harris had 11 points for West Virginia. The Mountaineers’ 38 bench points were its most in a Big 12 game this season. Published: Feb. 12, 2018, 9:39 p.m.